Preliminary design of a new section of inter-urban highway no. 40 from Tel Aviv to Eilat. The 20 km-long section includes rock excavations, bridges and interchanges. Performing a preliminary geotechnical report based on available geological data, classification of the rock mass into geotechnical units, recommendations for using raw materials along the alignment and planning guidance for excavation in rock. 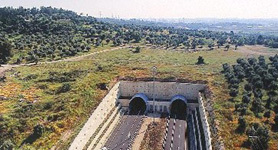 Construction of the main 86 km-long highway in Israel that runs between the Iron and Masmia Junctions, six lanes, 10 interchanges, 94 bridges, two tunnels. The project cost is NIS 1.3 billion ($US 300million). Performing geotechnical surveys in sections 15 and 16 as part of the road infrastructure design, classification of raw materials, and defining rock slope instability. Member of the Geotechnical Monitoring Team (GMT) during the construction period for implementation of support methods. 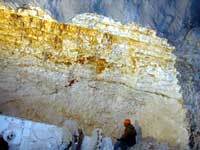 Two 460 meter long tunnels, each passing under the archeological site of Tel Hadid through limestone and chalk strata. Classification of rock mass as part of the comprehensive geotechnical report for the tunnel design (cooperation and under supervision of Geokom Ltd.). 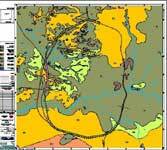 Geological monitoring during the construction period including detailed mapping of the rock. Preparation of a master plan for the city of Qiryat Shemona, which is located in the north of Israel. Qiryat Shemona is located along the active fault of the African-Syrian Rift. Every year dozens of seismic events are listed along this fault line (the Dead Sea Rift) with most of them occurring in the Gulf of Eilat. Historical evidence indicates that destructive events occurred in the cities of Beit Shean, Tiberias and Sefad, all of which are located in the Galilee region along the fault . Qiryat Shemona is located in the foothills of the Eastern Galilee and extends to the Hula valley. Consequently, amplification of ground movement during an earthquake is anticipated due to the topographical profile together with the existence of soft soil layers. GGS, in cooperation with G.Y.A. 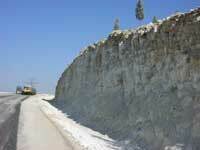 Soil and Foundation Engineering Ltd., were the geotechnical consultants for the design team. 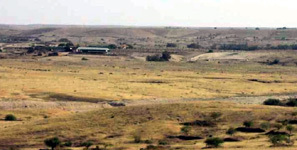 The overall task included the involvement of two government bodies – the GSI (Geological Survey of Israel) for preparation of detailed geological maps (Metula Sheet) and the GII (Geophysical Institute of Israel) to preform reflection lines and a study of site effects in and around Qiryat Shemona. The detailed study of seismic hazards in Qiryat Shemona is implemented in the instructions detailed in the updated Israeli Code IS413 – “Design provisions for earthquake resistance of structures”. The IS413 stipulates that appropriate geological investigations must be performed for urban planning because of the level of local horizontal ground acceleration, specifically in the vicinity of active faults.